How often do you think about lentils? When they’re offered as the soup-of-the-day at your favorite lunch spot? I love lentil soup (and always have it on hand in the freezer), but one of my other favorite ways to enjoy lentils are as a warm side dish – comforting, nutritious, and delicious! This is one of the recipes out of the latest cookbook by Ina Garten (Barefoot Contessa – How Easy Is That? ), but I’ve made it so many times – I use what I have on hand and it’s the perfect accompaniment. Start by coursely chopping 2 carrots (cut in quarters lengthwise – then about 1/2 inch dice), clean and chop one leek (white and light green part) [today I had a large shallot that I used as a substitute], and one chopped garlic clove. Saute the carrot and leek in 2 tablespoons olive oil over medium heat for about 5 minutes. Add the garlic and saute for another minute. Remove from heat and set aside. Bring 4 cups water, one whole onion stuck with 6 cloves, and one cup of lentils to a boil. Once boiling, reduce heat and add the carrot/leek mixture. Simmer uncovered for about 18-20 minutes (until lentils are tender to the bite). While lentils are simmering, whisk together 1/4 cup olive oil, 2 TBLS red wine vinegar, 4 tsp dijon mustard, 1 TBLS kosher salt, and 1 tsp ground black pepper. When lentils are ready, discard the onion and drain. 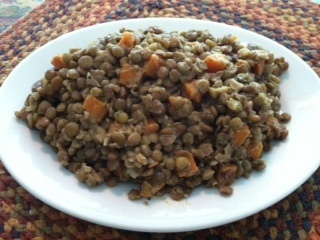 Transfer lentils to a large bowl and add 1 tsp. butter. Add the dijon vinaigrette and toss together. Let lentils stand for at least 15 minutes before serving so they can soak up the dressing. That’s it – the perfect side dish! Enjoy! Ever have that leftover one or two pieces of chicken that you’re less than excited about eating again – but you don’t want to toss it out? Here’s an idea. Turn that leftover chicken into a hearty chicken stew and serve it over fresh-made biscuits. Perfect for a fall or winter night. Heat about 3 tablespoons of butter in an oven-proof skillet (or wrap the plastic/wood handle with aluminum foil so it can be put into the oven). Add in half a chopped onion or a shallot and cook until translucent (5-7 minutes). Sprinkle 3 tablespoons of flour into the onion mix and stir around for about a minute. This will create a ‘roux’ (the consistency will be like paste). That’s the base for the delicious gravy. Then, slowly (bit by bit) stir in about 2 cans (almost a quart) of chicken stock. Stir the stock into the roux – and voila – you’ve got chicken gravy! Season with salt and pepper. From there, add in the cut up chicken pieces and anything else you have on hand along the line of veggies. Maybe a cut up carrot or two (chopped and steamed in the microwave for a minute or two)? A handful of frozen peas and/or corn? A handful of mushrooms? I had some leftover mashed potatoes that I put atop the chicken and gravy before baking. Once all the goodness is in the mix, pop the pan in the oven at 400F for about 15-20 minutes until it’s bubbly-ready and the flavors have all had a chance to come together. My recipe for homemade biscuits could not be easier. I’d make these before putting together the chicken and gravy, because when that’s ready – you’ll want to eat! Start with 2 cups flour in a bowl. Add in 7 tablespoons of shortening (crisco or butter), 3 teaspoons baking powder, and 1 teaspoon salt. Using a fork or a pastry knife, mix together until you get a crumb-like consistency. Stir in 2/3 cup milk until dough forms. Turn out onto a flat surface, pat down or roll to about 3/4-inch thickness and cut out biscuits. If you don’t have a biscuit cutter, use the top of a drinking glass dipped in flour. Put on a parchment lined baking sheet and bake at 425F for about 15 minutes – until light golden brown. 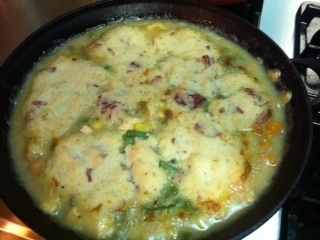 Pour chicken and gravy over biscuits and enjoy! This dish won’t disappoint! Way back in May, I wrote about Old Favorites – one of them being Eggplant Parmesan. 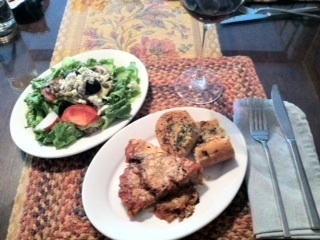 I prepared it again last week (sorry for the delay/work sometimes gets in the way of all this fun cooking!). I talked about the ease of making it and popping one tray in the freezer for an easy weeknight meal, but I never told you how to make it. If you think you don’t like eggplant – or don’t have any idea how to work with those purple veggies in the store – this one’s for you. It’s tasty and delicious – and you won’t be disappointed. Buying two medium/large size eggplants will make you about two round pie plates – one for now and one for the freezer to enjoy later! Using a large bowl, whisk together the 4 eggs beaten a handful (1/4 cup) of grated Parmesan cheese. Heat olive oil (enough to cover bottom – plus a little more) in a large skillet. When oil is hot, dip eggplant slices into egg/cheese mixture and gently fry – they cook quickly. Fill the pan with as many as will lay flat. Watch them carefully and turn when golden brown. Once golden on both sides, remove to rest on paper towel lined sheet pan or dish. Continue cooking all the eggplant slices as described. As the pan/dish fills up, place more paper towel between slices to soak up more of the excess oil. After you’re done with the cooking – it’s time to assemble the trays of eggplant. (I use tin pie plates as they are quick, easy, go from freezer to oven, and can be discarded after baking/eating.) Use your favorite Marinara sauce (3 cups) or make your own. Spoon enough sauce to coat the bottom of the pie plate. Doesn’t have to be thick – just spread it around to coat the bottom. Line the pan with the first layer of eggplant slices. They shouldn’t overlap too much, but a little is okay. Spread more sauce on top of the eggplant slices. Sprinkle generously with grated Parmesan cheese (3/4 cups total) and as much ground black pepper as you like. (You can also use red pepper flakes, if you’re so inclined.) Repeat layering until the goodness reaches the top of the baking dish. Top with a final layer of sauce and grated cheese/black pepper – and you’re ready to bake or freeze. To bake right away, place pie plate on a baking sheet (in case it bubbles over) and bake for 25-30 minutes at 400F until it’s brown and bubbly – delicious looking! Be sure to watch it as it gets to 20 minutes and remove it when it’s hot, bubbly, and golden to your liking. Let it rest for 10-15 minutes – slice into wedges – and enjoy with some garlic bread, salad, and the beverage of your choice! If you’re freezing a tray, cover with aluminum foil before baking. When ready to use, place covered dish (frozen) in 350F oven for about 30 minutes. Then remove the aluminum foil and bake as described above. Let me know how you like it!